A grand total of ninety people cycled through this tiny restaurant in the heart of Jamaica Plain over the course of the evening. Special guest speakers Les Kaufman (ecologist, BU) and Angela Sanfilippo (Massachusetts Fishing Partnership) worked the crowds tirelessly, offering a personalized presentation to each table explaining their vision of the issues affecting Georges Bank and the fishermen who depend on it. Meanwhile, the kitchen kept the fires burning throughout the evening, serving up plate after plate of Georges Bank's bounty. Chefs in the kitchen prepare for the night. Guests enjoy their cocktails and preview the menu to come. Chefs plate the first course, with Georges Bank scallops. Scallop ceviche with hakurei turnip, green apple, and arugula. Featured guest Angela Sanfillop (Massachusetts Fishermen's Partnership) chats with guests about the importance of protecting Georges Bank. Chef makes hake brandade -- a puree of potato and hake. Chef plates the hake brandade, on toast. 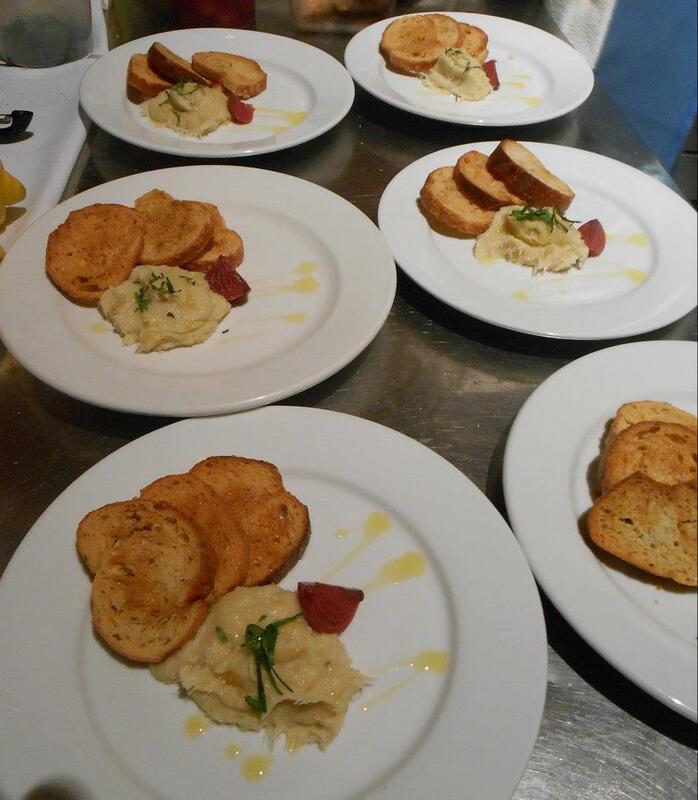 House-cured hake brandade with pickles and toast. 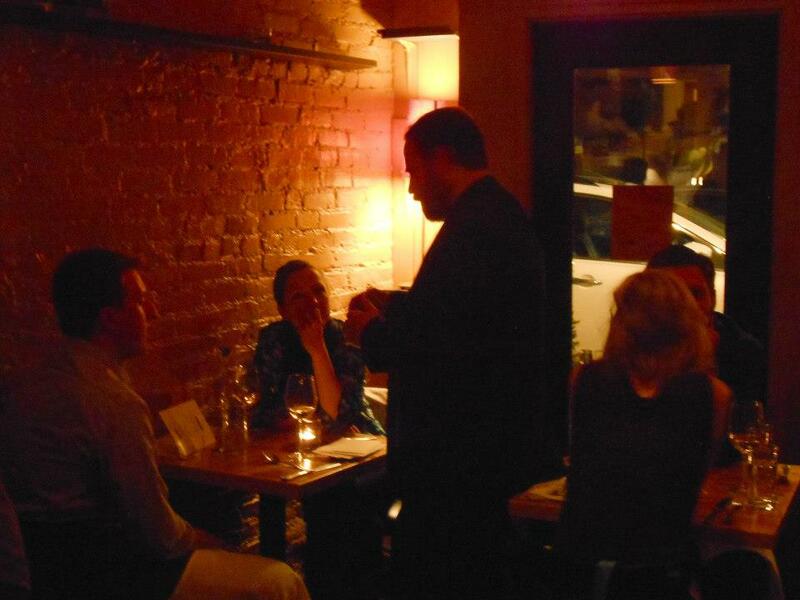 Guests enjoy the meal and the interaction with servers and speakers. Chef plates the third course, with Georges Bank skate. Skate wing with fingerling potatoes, radish, and spring onion butter. Guests learn about the variety of species found on Georges Bank from Les Kaufman, featured speaker and marine scientist at Boston University. Dessert: Goat cheese panna cotta with rhubarb compote and amarettia. The chef's secret to this recipe? Agar-agar, made with seaweed. Dessert: Goat cheese panna cotta with rhubarb compote and amarettia. Les Kaufman is Professor of Biology in the Marine Program at Boston University. Les works to conserve aquatic species and habitats by harmonizing coastal societies with the aquatic ecosystems that support them, particularly in the areas of fisheries, ecological economics, and adaptive management. He is also Principal Investigator for Marine Area Management Science with Conservation International. Angela Sanfilippo, based in Gloucester, has worked tirelessly for over three decades to promote the welfare of the local fishing community that she and her husband belong to. She is the President of the Gloucester Fishermen’s Wives Association and Executive Director of the Massachusetts Fishing Partnership. In both of these roles, she is inspired by an unwavering commitment to preserving a viable fishing industry. 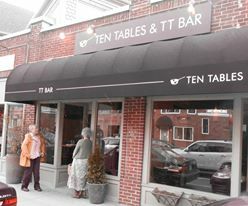 Ten Tables is located at 597 Centre St. Jamaica Plain, MA.